July 7, 2009 – In an interview with the Nelson Mandela Foundation, Professor Muhammad Yunus touches on the eradication of poverty, the necessity of educating women to uplift a nation and the inspiration he has received from Nelson Mandela. Of all your successes, what is the one legacy you wish to leave behind? The legacy I dream of leaving behind is to have played a part in creating a poverty-free world. A poverty-free world is something that I firmly believe is possible. The reason I believe this is that poverty is not created by poor people. It is artificially imposed on them by the system, through the institutions and policies that we have created. If we can create a framework which allows people to unleash their capacity and creativity, then there is no reason why anyone should remain poor. 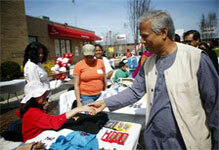 Grameen Bank, by providing credit to the poor, helps to unlock that creativity. If we create more institutions that put poor people at the centre, then we can eradicate poverty. You are also known for promoting education and leadership among women. What are your hopes for the development of young women in Africa? We learned very early on in our work with Grameen Bank that women hold the key for the development of the family and community. Our focus, therefore, has always been to work with them to empower women as a way of empowering communities and changing society. This experience has convinced me that we can only really change the world and overcome poverty if all countries educate and financially empower their women, particularly girls and adolescents. Microfinance institutions have already been set up in countries all over Africa. This is an important step, and these have to expand, be strengthened and be made more sustainable. Educational facilities and employment opportunities for young girls and women need to be expanded and strengthened. Women all over Africa, like those in my own country [Bangladesh], are dynamic and enterprising and given the opportunity they would be the agents to help countries break out of the cycle of poverty. On returning to South Africa what are you most looking forward to? I have been to South Africa five times. Every time I have been to South Africa I have been struck by the beauty and vibrancy of South Africa, and the energy and entrepreneurship of its people. It is a country that has a great present and an even greater future. I am always happy to return. I look forward to sharing my ideas and my experience with the people of South Africa, particularly the young people. I’m also keen to share my ideas of social business, and I am glad the Foundation is making it possible for me to interact with members of the business community. I look forward to seeing more of your beautiful country too. And, of course, I will be very happy to see Mr Mandela again. My last visit was to Johannesburg in 2007 to celebrate the 89th birthday of Madiba, and the launching of the Elders Project with him. That was a great and memorable occasion for me. You were 24 years old when President Mandela was sentenced to life imprisonment (on June 12, 1964). Can you recall how his imprisonment impacted on your own life in that period and beyond? At that point in my life, I, along with others of my generation, viewed Mr Mandela as an icon fighting for freedom and democracy. His fight against apartheid in South Africa was rebellious and one of the first instances I had seen of anyone so strongly pursuing a fight for justice. Mr Mandela’s imprisonment gave me a sense of hope: [here was someone] that believed in a cause so much that he was ready to spend the rest of his life in jail. This in turn inspired me, along with others of my generation, into a lifelong fight for causes that we felt strongly about, including my own country’s struggle for liberation. With so many examples of politicians and leaders falling for the trappings of office, rather than being driven by the needs of their people, how do you think we can inspire young people to believe that an ‘alternative’ type of governance is attainable? Finally, what is your message to Mr Mandela in his 91st year? Happy 91st birthday Mr Mandela, what a privilege it is to know you! You are an inspiration not just to me but to millions around the world. You have led your country, where injustice and violence prevailed, to peace and democracy. Your untiring activism for human rights and justice has instilled hope in millions around the world that it is possible for us to live together in peace for our common betterment of humanity.